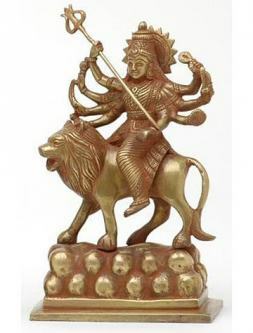 Sorry, we are currently sold out of 'Durga On Lion 18 Inch Statue from India'. Please click the Wait List link below and you will be notified when it is back in stock. 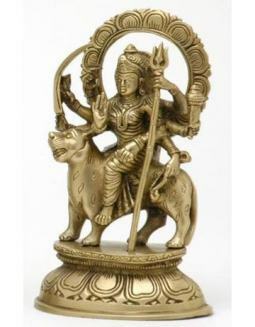 This Brass Durga on a Lion Statue stands 18 inches tall, and the majesty and beauty of the Goddess Durga is conveyed in this statue. 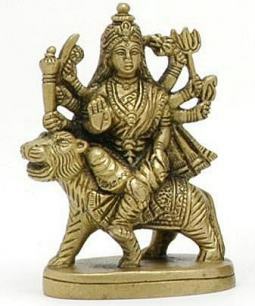 This is the biggest Durga Statue that we currently carry, and the size alone allows for the artists who made this statue to impart fine details in the face and clothing of Devi Durga and her vehicle, the Lion. 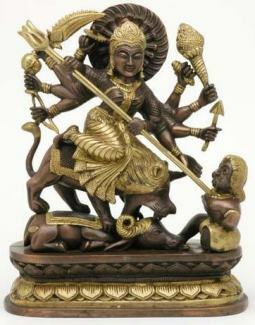 Aside from the Lion, Durga has many weapons that are commonly associated with her in this statue, such as the trident, mace, sword and bow.